The Owl RE team writes and speaks regularly on evaluation and related areas. Our philosophy is to share as much as possible our know-how and beliefs on the exciting and topsy-turvy world of evaluation. We also encourage our clients to share their evaluation reports. On this page you will find all our available resources. Please feel free to share and use. This presentation provides an introduction to humanitarian advocacy; what is humanitarian advocacy and how does it differ from other types of advocacy and communications? The advocacy process and tactics are explained. 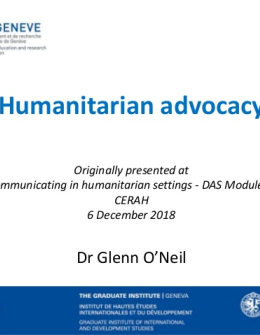 Originally presented in December 2018 at the University of Geneva for the “Communicating in humanitarian settings” Module of CERAH. 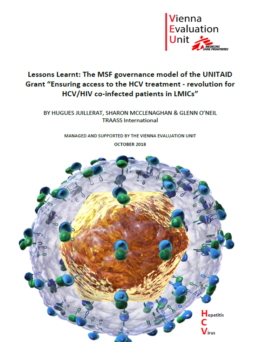 Glenn led a three-person team for TRAASS International to carry out this Lessons Learnt review of MSF’s work for Hepatitis C globally (funded by UNITAID). 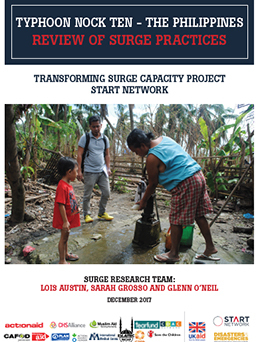 Involving stakeholder interviews and a validation workshop with key stakeholders, the review supported MSF in drawing out key lessons for future projects in this area. Glenn led a five person team for this end of project evaluation that was carried out through country visits, surveys, interviews, group discussions, focus groups and outcome workshops. 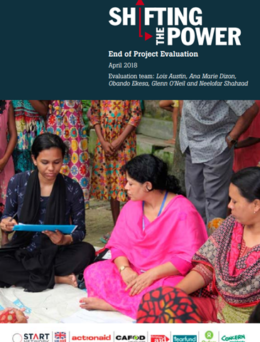 Through these methods and the participative process, the evaluation team directly interacted with 51 local NGO partners in Bangladesh, DR Congo, Ethiopia, Kenya and Pakistan. For each crisis, the main trends and challenges for humanitarian actors were identified through surveys and interviews with those staff directly involved in responding, complemented by available documentation, monitoring data and reporting. 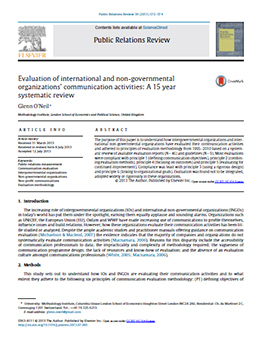 Abstract: The purpose of this paper is to understand how intergovernmental organizations and international non-governmental organizations have evaluated their communication activities and adhered to principles of evaluation methodology from 1995–2010 based on a systematic review of available evaluation reports (N = 46) and guidelines (N = 9). Most evaluations were compliant with principle 1 (defining communication objectives), principle 2 (combining evaluation methods), principle 4 (focusing on outcomes) and principle 5 (evaluating for continued improvement). Compliance was least with principle 3 (using a rigorous design) and principle 6 (linking to organizational goals). Evaluation was found not to be integrated, adopted widely or rigorously in these organizations.